Several months ago, my parents needed a new dresser in their apartment in the retirement community where they live. They didn’t want to pay big bucks – but I didn’t want them to use a raggedy dresser from a thrift store– and we found the perfect solution. I bought them a high quality wood dresser on the Wayfair web site for about $300, and was able to pay someone to assemble the furniture. Wayfair offers a service where they’ll arrange to have your furniture assembled for a reasonable fee via a website called Handy.com that connects local home services pros with people who need work done. Handy prescreens workers, too, checking their credentials and running a background check. One of the best things about Handy is the person comes at the exact time you pick — unlike cable company people who show up within a four-hour time range, forcing you to hang around waiting for hours. I made arrangements for the assembly through the Handy website and was relieved that the person could do the work on a week night after 6 p.m., which I needed since I work full-time. That was a big plus! He called in advance on the scheduled day and confirmed the appointment, and showed up promptly at the designated time. In the meantime the very heavy package with the dresser parts from Wayfair arrived and a maintenance man hauled it to my parents’ apartment. In a little over an hour, the furniture assembly man had the dresser finished — and it worked great! 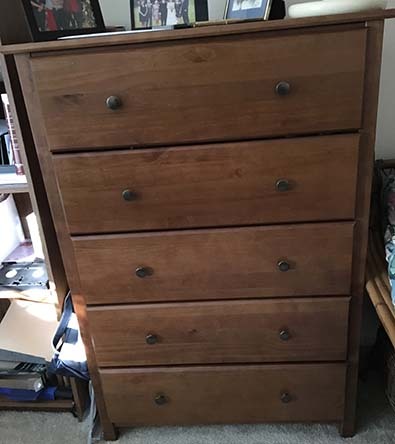 The drawers pulled in and out smoothly and the item looked like it’d been bought at a good furniture store. I was totally impressed with the whole experience! I’d recommend this service to anyone, and I’ll use it again in the future. Right after our experience, I read that Walmart is starting to use Handy.com, too, to find pros to help shoppers do things like mount a TV on a wall or assemble a bookcase. Check Handy.com out if you’re not handy yourself! 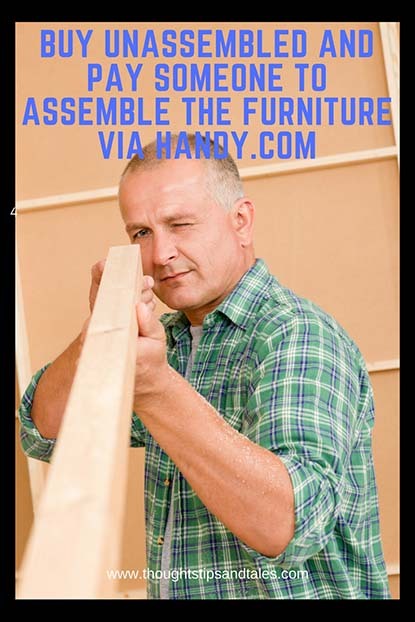 This entry was posted in life and tagged assemble furniture, furniture assembly, handy.com, pay someone to assemble furniture, wayfair. Bookmark the permalink. Thanks! It turned out to be the perfect solution because I couldn’t buy a dresser anywhere and lug it in there to the second floor myself – and it would’ve been pretty expensive to buy one at a furniture store and have someone deliver it. So buying it online worked really well.